Andries Meijerink received his MSc and PhD degree in Chemistry at Utrecht University. After a post-doc in Madison (University of Wisconsin) he returned to Utrecht in 1991. In 1996, at the age of 32, he was appointed at the chair of Solid State Chemistry in the Debye Institute of Utrecht University where he leads an active group in the field of luminescence spectroscopy of quantum dots and lanthanide ions. In the field of lanthanide ions his work involves fundamental research on the energy level structure of both 4fn and 4fn-15d states and finding new concepts related to applications in solar cells, LEDs and scintillators. His research on quantum dots is aimed at unraveling the influence of quantum confinement and surface effects on the electronic structure and exciton dynamics of quantum dots through optical spectroscopy and using the quantum dots as labels in bio-imaging. Research on luminescence of doped nanocrystals integrates the two themes. Recent work has resulted in a better fundamental understanding of photonic effects on optical processes, insight in energy transfer processes and application of luminescent nanocrystals as probes. The work has resulted in over 350 publications and 10 patents and is highly cited. 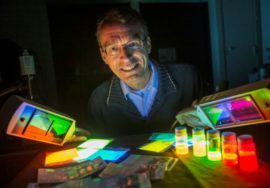 For his research Andries Meijerink received several awards, including the Shell Incentive Award (1995), the Gold Medal of the Royal Dutch Chemical Society (1999) and the Centennial Award for Luminescence and Display Materials from the Electrochemical Society (2002). In 2009 he was elected into the Royal Dutch Academy of Sciences.